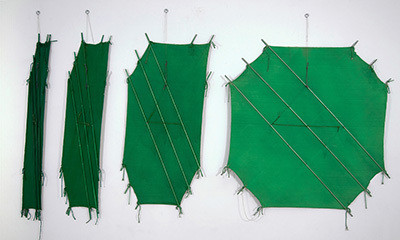 In 1972, Richard Smith exhibited his first 'kite' paintings at Kasmin Gallery. More kite paintings followed at his show in 1975 at O.K. Harris Gallery in New York. In the same year, Smith was offered a retrospective at the Tate Gallery and he made use of the central Duveen Gallery to display a series of large-scale kite works, both affixed to the wall and suspended from the ceiling, their ropes trailing to the ground. Richard Smith has always been interested in paintings which work in three dimensions, often making use of both floor and wall. Canvases stretched over wooden frames, then painted, appeared in 1963. Gradually his wooden frames diminished in size and the canvases became more wall mounted affairs. Eventually, Smith replaced the heavy wood with thin aluminium poles on which the painted canvas was stretched in shapes ranging from a narrow, vertical rectangle to square. A single work might consist in three or more canvases either overlapping or hanging in sequence. Richard Smith was by then living in the English countryside, having returned from New York, and his colours underwent a shift towards the pastoral and muted. The sequencing of canvases in a singular work, with a single colour rendered in different tones from canvas to canvas, reminds one of Monet's serial paintings, such as his Haystacks series, with a singular subject painted in different chromatic keys. Smith's approach to painting echoes that of the French Support-Surfaces group, who at the time were investigating the possibilities of unstretched canvas, manipulated into different shapes, using both wall and ground as spaces for two-dimensional artworks. The kite paintings are meticulously worked through. The contrast between hard poles and soft canvas is carried over to the use of string and rope, the soft means by which the hard stretch is obtained. As Barbara Rose wrote in the Tate Gallery's catalogue to Smith's exhibition, 'The conception of the stretcherless paintings, that are surface alone, has finally coalesced: separable elements are once more thoroughly synthesised in the new format... These consistent allusions to the human condition prove that abstract art is not necessarily divorced from man's experience'. Richard Smith was born in Herfordshire in 1931 and lives in New York state..